2012 Drake and Chris Brown are involved in fight at a New York City nightclub, with Brown accusing Drake of throwing a bottle at him. They had beef over Rihanna, whom they both dated. 2009 Bob Bogle (lead guitarist, bassist for The Ventures) dies of non-Hodgkin's lymphoma at age 75. 2007 Chris Tomlin's cover of "Indescribable" is used as the official wake-up call for NASA astronaut Patrick Forrester while on the Space Shuttle mission STS-117. 2006 Rufus Wainwright, son of folk singer Loudon Wainwright III, recreates the whole of Judy Garland's legendary 1961 Carnegie Hall concert at the famous institution in order to mark the show's 35th anniversary. 2005 Backstreet Boys stray from their traditional pop fare with their rock-leaning comeback album, Never Gone. It debuts at #3 in America, sells over 10 million copies worldwide...and is slayed by critics. 2003 Gerry Marsden of Gerry and the Pacemakers is awarded a Member of the British Empire medal by Queen Elizabeth in London. 2003 "Bring Me To Life," the debut single from Evanescence, hits #1 in the UK and stays for four weeks. The song peaks at #5 in America. 2002 Cher starts her Living Proof: The Farewell Tour. Planned for 59 dates, it ends up at 325, bringing in 260 million dollars. It's billed as her final tour, though she ends up returning to music years later. 1996 Mathew Fletcher, drummer for Heavenly, commits suicide at age 26 just before the release of the band's fourth and final album, Operation Heavenly. 1996 Beatles producer George Martin is knighted by Queen Elizabeth II. 1995 Irish blues rocker Rory Gallagher dies of a staphylococcal infection following a liver transplant at age 47. 1994 Noted film composer Henry Mancini dies of pancreatic cancer at age 70. 1989 Pete de Freitas (drummer for Echo And The Bunnymen) dies in a motorcycle accident en-route to Liverpool from London at age 27. 1989 Carole King gets a star on the Hollywood Walk of Fame. 1980 Billy Joel's Glass Houses is the #1 album for the first of six consecutive weeks. 1979 Little Feat announce their breakup. 1975 America's "Sister Golden Hair" hits #1 in the US. The song is produced by George Martin and contains a guitar riff borrowed from George Harrison's "My Sweet Lord." 1972 Yet another unruly crowd at a Rolling Stones concert, with cops dispensing tear gas into the audience at today's gig in Tucson, Arizona. 1972 Actor Warren Beatty organizes his fifth benefit concert for doomed US Presidential candidate George McGovern at Madison Square Garden, featuring, among others, Simon & Garfunkel and Peter, Paul and Mary. 1971 "Kiss the Rain" singer Billie Myers is born in Coventry, West Midlands, England. 1971 Frank Sinatra announces his retirement from show business, only to return a year and a half later with the comeback album Ol' Blue Eyes Is Back. 1970 Eric Clapton's new band is introduced as "Derek and the Dominos" when they take the stage at the Lyceum in London. They tell the promoter they are "The Dynamics," but he convinces them to add the "Derek," which is a nickname for Clapton. His mangled name interpretation sticks. 1970 Blood, Sweat & Tears begins a tour of Romania, Poland, and Yugoslavia on behalf of the US State Department. Working as government ambassadors under the Nixon administration puts the band in bad standing with the protest movement they were part of when they played Woodstock. 1970 Grand Funk Railroad unveil their famous "Closer To Home" billboard in New York, which costs $100,000 and takes a full city block to promote their new single of the same name. 1969 Blues singer Wynonie Harris, known for ribald tunes like "I Like My Baby's Pudding" (1950), dies of esophageal cancer at age 53. 1967 The Beatles record "All You Need Is Love." 1967 The Monkees record "Daydream Believer." 1966 The Beatles record "Here, There And Everywhere." 1965 The Beatles record "I've Just Seen a Face," "I'm Down," and "Yesterday." 1965 The Beatles release Beatles VI. 1963 Chris DeGarmo (lead guitarist for Queensrÿche) is born in Wenatchee, Washington. 1961 Boy George (lead singer of Culture Club) is born George Alan O'Dowd in Eltham, London, England. 1961 After a performance at the Majestic Theatre in Newcastle, England, Gene Vincent is mobbed by admirers who accidentally push him down a flight of stairs, where he is knocked out. 1961 Elvis Presley's 7th movie, Wild In The Country, premieres in his hometown of Memphis. 1958 Nick Van Eede (of Cutting Crew) is born in Cuckfield, West Sussex, England. 1958 Fats Domino records "I'm Gonna Be A Wheel Someday." 1957 Ava Gardner divorces Frank Sinatra. 1953 Elvis Presley graduates from Humes High School in Memphis, Tennessee. 1949 Alan White (drummer for Yes) is born in Ferryhill, County Durham, England. 1949 Jim Lea (multi-instrumentalist of Slade) is born in Wolverhampton, Staffordshire, England. 1947 Barry Melton (original lead guitarist for Country Joe & The Fish, Dinosaurs) is born in Brooklyn, New York. 1945 Rod Argent (keyboardist for The Zombies, founder of Argent) is born in St Albans, Hertfordshire, England. 1936 Renaldo "Obie" Benson (bass vocalist of The Four Tops) is born in Detroit, Michigan. 1931 Sax player Junior Walker (of Junior Walker & the All-Stars) is born in Blytheville, Arkansas. 1909 Burl Ives is born in Jasper County, Illinois. 1905 Jazz banjoist Nappy Lamare is born Joseph Hilton Lamare in New Orleans, Louisiana. 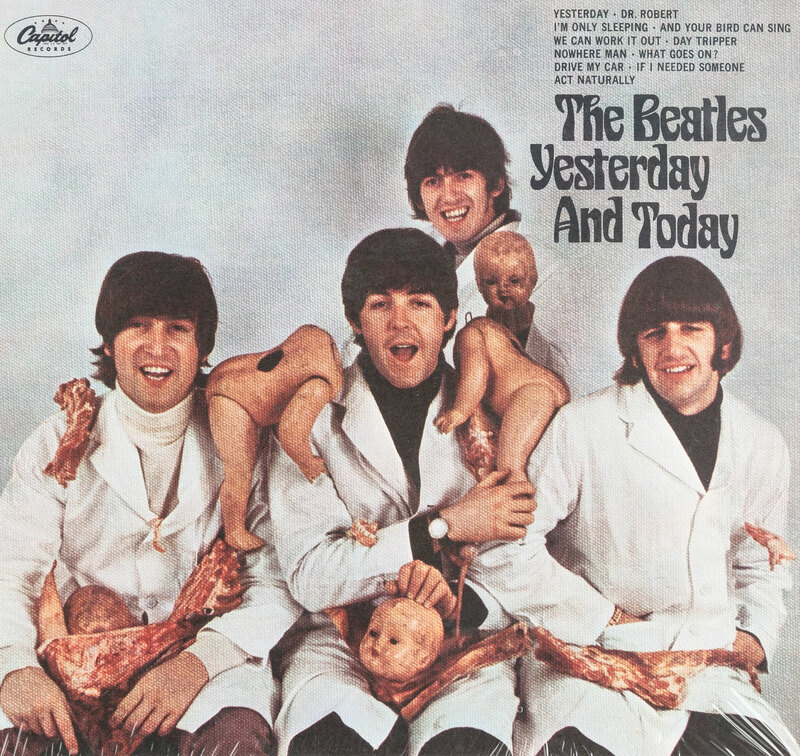 1966Deeming its "butcher cover" in poor taste, Capitol Records recalls the new Beatles album, Yesterday and Today, which is scheduled for release the next day and has already been sent to stores. 2002 Mick Jagger of The Rolling Stones is knighted by Queen Elizabeth II. 1990 Four days after being arrested for performing obscene songs at a Florida nightclub, the rap group 2 Live Crew performs at the Ozone Club outside of Atlanta. Authorities had warned the group that they would be arrested if they performed their dirty songs, so the rappers encourage the crowd to sing the obscene lyrics for them, resulting in about 500 people singing lines like "that's the way we like to f--k" as police officers look on. No arrests are made, and the group gets even more publicity and a bump in sales for the album they released a year earlier. 1964 Workers at a London railway station open a tea chest addressed to The Beatles and find 12-year-old Carol Dryden, a fan who'd decided to mail herself to the group. 1961 Patsy Cline gets in a nasty car accident in Nashville, when she is thrown through the windshield. She is hospitalized for about a month, during which time she is visited by the woman who will become her protégé: Loretta Lynn.